Conveniently located at the Antigua Yacht Club Marina, BWA Yachting in Antigua is managed by James Benson, who has lived on the island since 1997 and has extensive experience and knowledge about Antigua, the Caribbean and its marine industry. As a former superyacht charter captain for over 20 years, James is well placed to assist captains and crew with advice about itineraries and services throughout the territory. 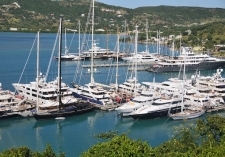 BWA Yachting in Antigua provides an all-encompassing range of services, including the processing of immigration and customs procedures throughout Antigua and Barbuda, and can obtain in advance, any visas or visa waivers that crew or guests may need for Antigua. Assistance in obtaining USA or Schengen visas is also available. BWA offers secured APA delivery at very economical rates, berth reservations and duty free bunkering, land and air transportation, VIP handling at FBO 2000, duty free inbound and outbound freight handling, parts sourcing and technical solutions and support services. They also provide crew placement, working closely with BWA St.Maarten, BWA in Antigua can also supply all provisioning requirements, either sourced locally, or flown in from St.Maarten or from abroad. With a commitment to providing the highest level of service, coupled with accountability and transparency, BWA Antigua serves their valued customers efficiently and competitively.